Christmas is coming! Is everyone excited? Stressed? Tired of the hype already? I thought I'd make a post to get us in the Christmas spirit. Let's talk about GINGERBREAD? Do you or your family make a gingerbread house? Is it a tradition? What about gingerbread cookies? Even though they seem to be a Christmas staple, to you actually like gingerbread? Last edited by Flasher on Tue Dec 04, 2018 11:39 am, edited 1 time in total. I make a gingerbread house every year -- not from scratch. I love the smell of gingerbread cookies, I love decorating gingerbread cookies, and I love the look of everything gingerbread. But, I actually can't stand the taste of gingerbread! Last edited by Flasher on Tue Dec 04, 2018 11:29 am, edited 1 time in total. I love gingerbread houses! I have bought a kit for Grayson and I to do together when he gets out of school for Christmas break. I have never tried to make gingerbread cookies - but I love to decorate them and I LOVE to eat the soft ones!! There is a big hotel called the Grove Park Inn over in Asheville. They have the national gingerbread house competition and people from all over enter. We are hoping to go over there and see some of the ones that are on display! Last edited by Monroe1218 on Tue Dec 04, 2018 11:13 am, edited 1 time in total. December Daily - 75% complete! I've never made a gingerbread house or cookies but I keep telling myself I would love to make one. So I can't say if I love gingerbread or not. Here's a question for you all... Are gingersnap cookies the same as gingerbread cookies? I have made those. I get a gingerbread house for the grandkids to decorate each year. They usually end up eating the decorations, but not the house. I don't think I've ever had a gingersnap or gingerbread cookie. I think I know this. But, remember, I could be wrong. If my memories of my Grandma in the kitchen are accurate, Gingersnaps and Gingerbread Cookies are basically the same. I remember one year she ran out of homemade gingerbread that she was using to make pie crusts. She ran out and ended up just crushing up a box of Gingersnaps (which she always had on hand for Grandpa). I think the only difference is one is made with dark brown sugar and the other with molasses, but the other spices and flavors are the same. I think. Perhaps because my DD's birthday is Christmas Eve we had a tradition of making those house kits on Christmas Eve. I did try once to make the house parts from scratch (only once!). Fresh baked gingerbread cookies are yummy to me. I no longer eat flour so that treat is another one I miss. Gingersnaps are thin and crispy compared to gingerbread cookies. A box of the 'snaps were always a favorite in my house. My son was especially fond of them. i love gingerbread, gingerbread cookies, ginger snaps..you name it!!! I did make one last year, but by far I am not great at it. I think it is just fun to do with whatever Grandkids may be in town. My DH and I both LOVE gingerbread! So, I may "try" to make one just to eat it, lol. I can take it or leave it. In my childhood, I think we did a house ONCE. Because it was a kit and it was on sale. I was probably 8 or 9 (1988 or 1989). So its definetly not a tradition with my family, nor is it with DH's family so combined...we don't do one. I'll eat gingerbread cookies if they are around, but I do not bake them. Nobody I know bakes them. I did; however, buy some gingerbread dog biscuits from PetCo for my puppies and the devoured them! I love gingerbread-- anything... or molasses cookies are alot like them.. YUM! Hard to find in my neck of the woods but always around where I grew up. I have NEVER made a gingerbread house but have always always wanted to. I would more than likely eat more than I would construct !!! Laura I think it is funny you love the houses and the smell but hate the taste! 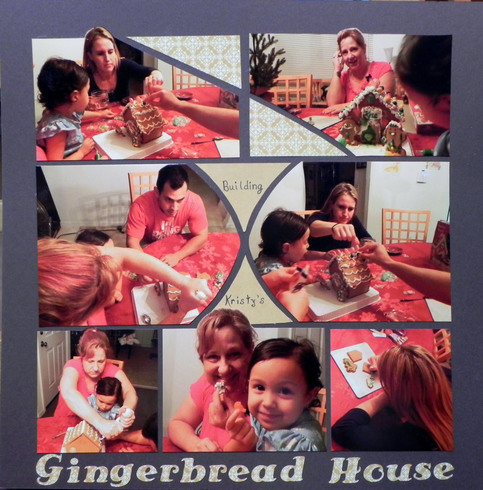 My family switched from Christmas Cooking baking day to Gingerbread house making day a few years ago. Easier on the oven that had to be on almost all day with so many baking together. They get pretty creative and do lots of different decorating. Lol funny you posted this I just got mine out of the box to make it today. I make one every year too. I remember one year when Sophie was a puppy I was making mine and had to answer the phone. I come back to finish it and I was missing a wall. Sophie had stolen it and was in the living room eating it. Needless to say I did not make one that year. I have always bought the house kits to let the kids decorate. They never eat them though. I'm not a big fan of gingerbread either. Ooooh.... I love gingerbread cake with lemon sauce. Don’t always make a gingerbread house. But, maybe this year with the grandkids. Seem to have one in my pantry for some reason. I love all the activities that cone with Christmas! Grandkid programs next week! Some years we have made gingerbread houses, but it's not an every year tradition. I actually really DO like gingerbread, especially the gingerbread snaps that I make. They're really good. Some years we have. Not from scratch. I like the ones that are prebuilt and you frost and decorate them. Sam's club had some this year by Wilton so i picked one up. Now the time to decorate it.